Established in the year 1989 by Mr. Afif Yamout, an Audiologist from Beirut who certified in London. YHC started as an underground audiology lab only to grow to be one of the global leaders in medical-audiological field. The ongoing invention and development of this field’s services and products made YHC’s history rooted in innovation. YHC is dedicated to aiding patients who suffers from auditory problems in order to improve their lifestyle. Through this dedication YHC succeeded to guide thousands of its loyal customers toward more active life so they now can interact and merge in the community more effectively. YHC growth is based on an unparalleled variety of high-quality, innovative products and services that created cost-effective solutions and improved people’s lives. This success was achieved through Confident leadership, Effective management and committed professional team. 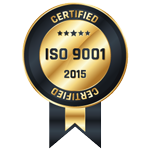 YHC is proud to be ISO9001 certified in spring of 2015.